I immediately logged on, and was presented with a nice-looking blank sheet. I can’t be bothered to fill in a whole load of cells manually, so I thought I’d start out by importing an Excel file from my local disk – I suspect a fair number of first-time users will go down this route. Once uploaded, it displayed without any obvious problems. One of the Excel features I do miss is that creation of a series by dragging down on the bottom right-hand corner of a cell doesn’t seem to work, and I can’t see any obvious way of achieving this. 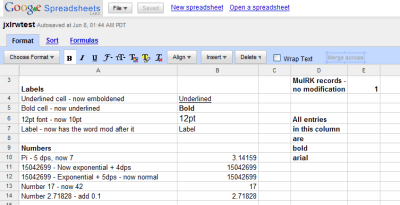 Interesting that the OpenOffice.org spreadsheet format is not supported as an import option, although of course you could export from OO.o as .xls or .csv and import from one of those. In general, the user interface is consistent with other Google offerings like GMail, and works well – and it is reasonably fast. Google will store your data for you. This could be dangerous for corporate users – I’m certainly not going to be importing any of my work-related spreadsheets. Data sharing. 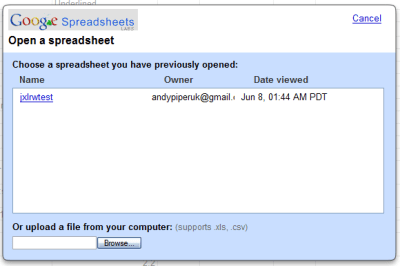 I can invite others to view or edit my spreadsheet, based on their email addresses. This is cool, but again, I’m nervous about what data I could reasonably share over the Internet. So, there’s a brief review. It seems like this is a handy (if basic) tool, if you don’t already have OpenOffice, Excel, or some other desktop spreadsheet program. This entry was posted in Uncategorized and tagged Google. Bookmark the permalink.